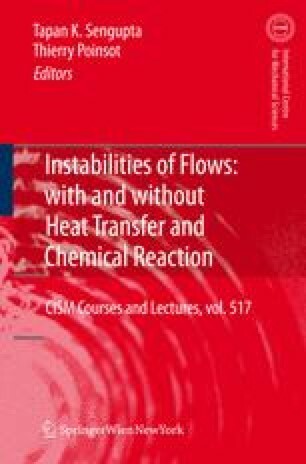 In this chapter we focus mainly upon the problem of vortex- induced instability that creates large perturbations without the appearance of Tollmien-Schlichting waves. Interaction of a shear layer with a finite-core vortex leading to unsteady separation in a boundary layer was noted by Doligalski et al. (1994) as one of the most important unsolved problems of fluid dynamics. Such unsteady separation is present in (i) Flow past surface-mounted obstacles; (ii) Dynamic stall and blade vortex interaction (BVI); (iii) Impulsive motion of bluff bodies; (iv) Near-wall turbulence and (v) Bypass transition triggered by aperiodic convecting vortices. In this chapter, we will focus on the last topic only, as an example of a physical mechanism during bypass transition. The same mechanism is also present in the other examples mentioned above. Unsteady flow separation has been discussed also in Degani et al. (1998) and other references contained therein. Brinckman & Walker (2001) have studied near-wall eddy formation in turbulent boundary layers. In this last work, a late stage of transition whose origin is completely different from one created by linear instability, was studied in a quasi two-dimensional framework. Smith et al. (1991) and Robinson (1991) have also discussed the formation of hairpin vortices in near-wall turbulence sites. In another set of studies, Peridier et al. (1991, 1991a) considered the scenario where a vortex placed above a plane wall caused the vortex to migrate and at the same time a thin unsteady boundary layer formed over the wall.